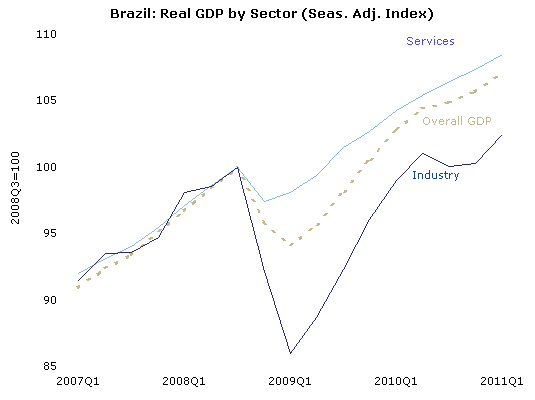 Industry in Brazil outpaced services for the first time since spring 2010. Industry grew at an annualized rate of 8.9 percent, more than twice the rate of services (4.3 percent, annualized). However, the sector is still only 2.4 percent above its pre-recession peak. In comparison, the service sector is 8.5 percent above its pre-recession level, and the overall economy 7.1 percent above that point. For more, check out our latest Latin America Data Byte.